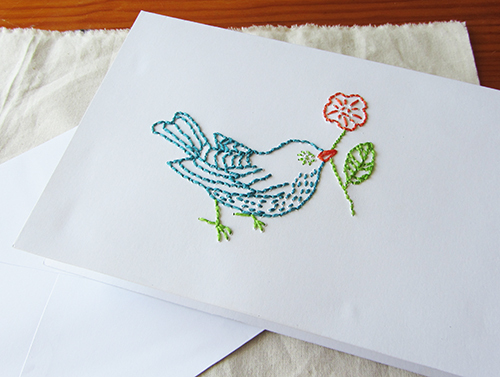 Embroidered card is something I have tried before (remember the birthday card?) 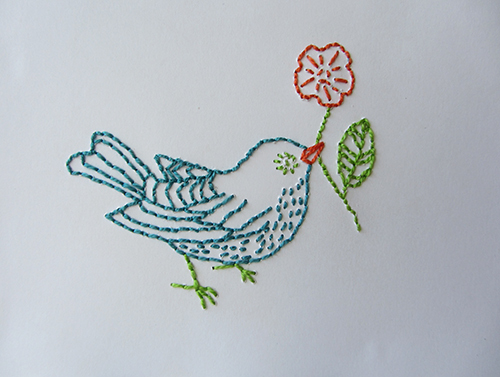 but this time I wanted to move to the next level and went for a fully embroidered birdie. The original design by Geninne can be found on her blog (right side bar). I have simplified it a bit to allow for the thickness of the perlé cotton I used. Even my daughter thinks it turned out quite well, she has asked for one for her birthday. I have to say I love the result, the perlé cotton give a bold look mixing very well with the crisp white card. Want to know how it is done? This is an easy project. Though I used running and back stitches, you could get away with using only a running stitch. The longest part is the embroidery, you should allow around 4 hours for full completion of the project. Here we go. 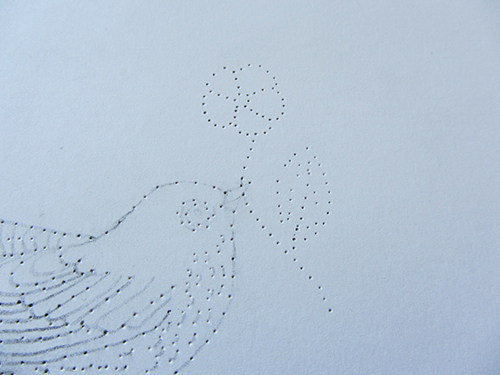 Trace the birdie on your tracing paper, being careful to the design orientation. If you want the final bird to face right, you should trace it as facing toward the left hand side. Then lay your tracing paper pencil side down on the card, double check the design position and transfer it by rubbing your pencil lead all over the lines. Pierce along the lines where you want your needle to go through the paper. 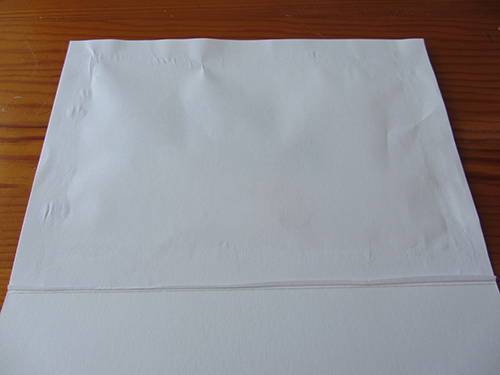 You don’t need to make a complete hole as the needle should be able to go through the paper. But if you prefer, you can complete the hole by piercing from the other side too. 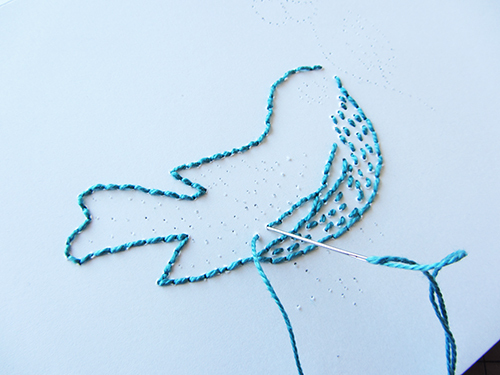 Before you start stitching a particular area of the design, erase the pencil lines. Use the perlé cotton to link holes as desired. When moving to a different area of the design, make sure to erase the pencil lines first, and so on. I recommend to stitch little by little bit because the design can get confusing once all the pencil lines are gone. It is now time to hide it by gluing an A5 piece of white paper over the stitches. Isn’t it nice? Do you see how endless the possibilities are here? 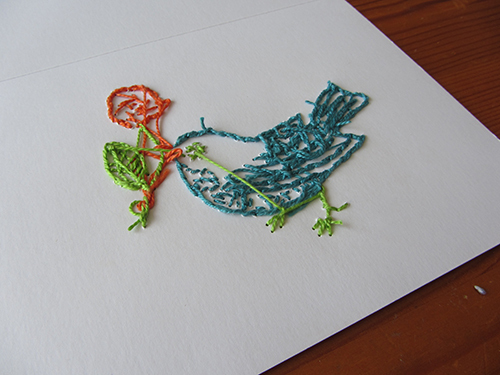 I was very inspired by the embroidery course I took over the week-end, I tell you all about it later this week. 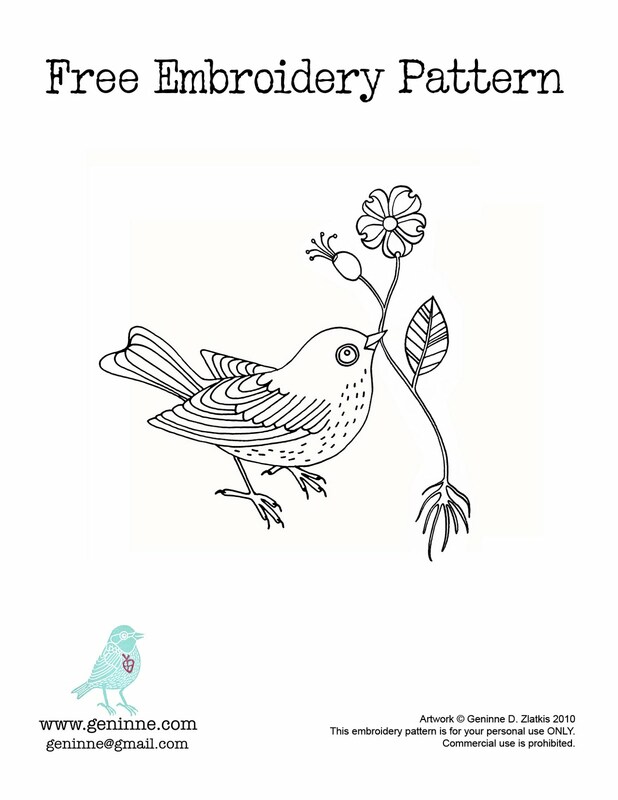 I am heading over to Handmade Monday to see what everybody has been doing! That looks a bit scary, as you can’t make any mistakes. Actually you can. I made a few mistakes and managed to cover them with the thread. I love this and have pinned so when I have a bit more time for new projects I can give it a go. Thank you. You’re very welcome! Please make sure to show me what your card when it’s done. 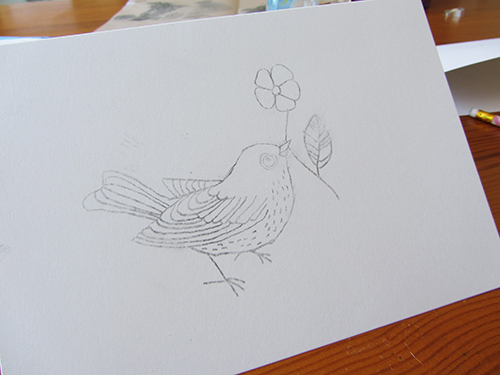 I like the card a lot, thanks for the tips on how to do it – another thing to add to my list of things I want to try. The finished card looks beautiful. Thanks for the great tutorial. Thanks for your comment, you’re very sweet. This is a lovely idea for a card, which you’ve executed beautifully. I can see why you daughter would like one for her birthday. I wouldn’t say no to one myself. Hope you have a creative week. Thanks, I am happy to see that several people seem to like the card. This one was meant for my grandmother. Thanks a bunch (I watched Fargo the other day and got really inspired by their “thanks a bunch”). You’re very welcome, and thank you for stopping by. A lovely card, and it sounds a good idea not to rub out all the pencil at once – I think I’d get very confused! Omg! I loved it ! I’m doing the Same thing gere I’m Brasil!!! Hu ho, please send me a picture of your work!